Wednesday 21st of May marks the 33rd anniversary of the signing of the World Health Organization International Code of Marketing of Breast-milk Substitutes. 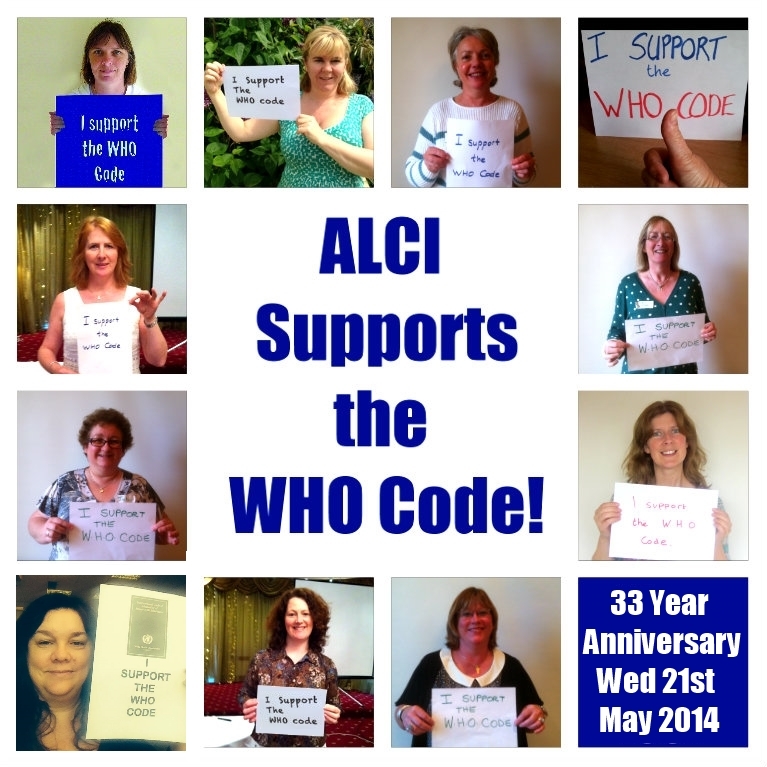 The Association of Lactation Consultants in Ireland upholds the Code in all of its actions, and joined in the worldwide celebration of the anniversary using social media. The Association of Lactation Consultants in Ireland recently held an informative educational event in University Maternity Hospital, Limerick for ALCI members. Prsenting on the day were Nicola O’Byrne IBCLC, Deirdre Kennedy Cranio-Sacral Therapist and Prof. Fenton ENT Specialist with experience in treating tongue tie. A successful Annual General Meeting was held in the middle of the day, and ALCI members, new and returning, had a chance to hear about ALCI’s progress during the previous year and air their views on the future. Details will be here soon about the upcoming Annual Conference, which will be in the greater Dublin area. Follow us on Facebook for updates. Occ asionally, health workers receive invitations to attend a conference outside of Ireland, with a formula company paying all expenses. Here is the response of Genevieve Becker, National Coordinator of the Baby Friendly Initiative in Ireland, to this issue. Tongue tie is growing in awareness as an important breastfeeding issue, but did you know that there are many ways of approaching it and babies may have a variety of oral issues that may impact on breastfeeding? Are you interested in attending a Lactation Education Study Day, to learn about recent research and personal experiences with oral and physical issues of the breastfeeding baby? If so, consider attending the upcoming ALCI Members Only Spring Study Day 2014. Assessing The Breastfeeding Baby With A Focus On Sucking Skills, CST Evaluation And Treatment Of Feeding-Bonding And Beyond, A Procedural Approach To Resolving Breastfeeding Difficulties and Personal Experience with Neonatal Tongue Tie are the topics which will be covered by three speakers on the day; Nicola O’Byrne IBCLC, Deirdre Kennedy Cranio-Sacral Therapist and Prof. Fenton ENT Specialist with experience in treating tongue tie. The Study Day is taking place on Saturday March 29th 2014 in the Parent Education Centre, University Maternity Hospital, Ennis Road, Limerick. This is an ALCI Members Only Event, and anyone interested in attending is welcome to join ALCI. ALCI promotes the professional development, advancement and recognition of International Board Certified Lactation Consultants (IBCLCs) for the benefit of breastfeeding infants and children, mothers, families, and the wider community. IBCLCs have extensive training through coursework and clinical practice hours, and they have passed an internationally recognised exam. Because of their training and required continuing education programmes, education and in research, IBCLCs are knowledgeable about evidence-based practices and experienced in managing a wide variety of complex breastfeeding situations.